Maybe I'm missing the obvious, but I couldn't make much of this book. There is no doubt that the New York Trilogy is excellently written by a true craftsman, yet it failed to touch me in any significant way. All three parts are somber detective stories, told by narrators that invariably loose their identity as the tale unfolds. Some might argue that they don't loose it but that they simply evolve, but that wasn't my impression. Identity appears to be an important issue of the book, and in this topic I found the most obvious proof of Auster's skillfulness. In a masterfull manner he plays with the various identities of the narrator, e.g. in "City of Glass", when an author assumes the identity of a private investigator (cheekily named Paul Auster) and then - in order not to give away this pretend identity to the object of his investigations - introduces himself with his true identity, which in turn becomes true and false, all at the same time. The author is also very aware of the arbitrary aspects of things, especially language, which shows repeatedly. 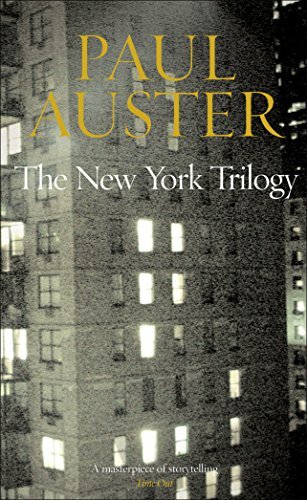 Unfortunately I have to say that, despite the quality of Auster's work, I did not care for the stories. Dolphus hat mir das Buch auf das Zurich Meetup gegeben! Merci vielmal. Wird jetzt auf meinem, neben dem Bett, wackeligen Buchstaffel! My admiration for Paul Auster just keeps growing! This is such an interesting triology of stories, they all fit together, and I'm still trying to figure out the connections between them. Each story has a mystery and / or a private detective at its heart, and the narratives are driven along by disappearances, mixed up phone calls, notebooks, writers, identities dropped and mixed. This is definitely a book to be read and re-read, and I'm sure that with each re-reading, a little bit more of the mystery becomes clear! Being sent to LindyB28 as a little RABCK - enjoy !